It took me a total of 7 hours to complete this assignment. Uploading the video was the main challenge. Since we could select any topic for this assignment, I decided to create an inspirational video that is also a bit of therapy for me as the caregiver for my grandma I experienced her final stages of life battle with breast cancer…very emotional process. 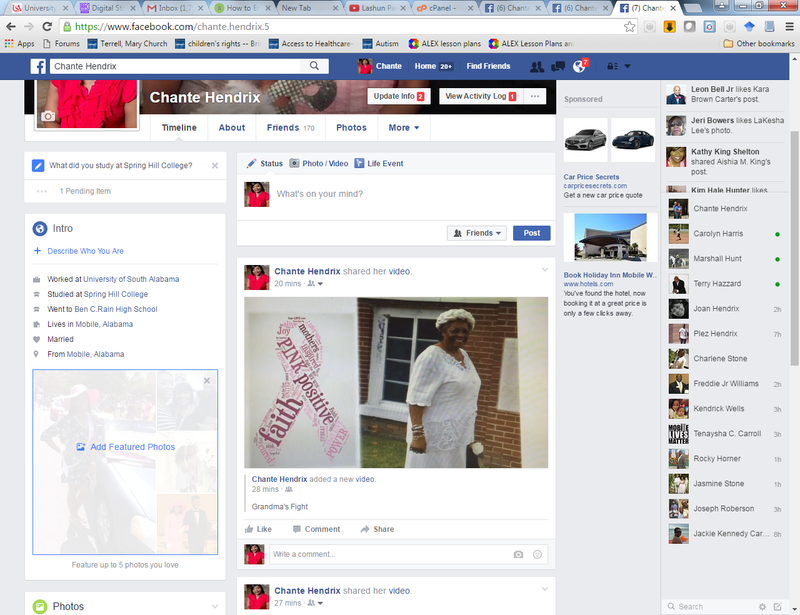 Chante Hendrix is on Facebook. Join Facebook to connect with Chante Hendrix and others you may know. Facebook gives people the power to share and makes the world more open and connected. Please post your video somewhere that we can see it without logging in. You may be able to change your facebook settings, but it might be easier to upload your video to some other site (perhaps your blog). 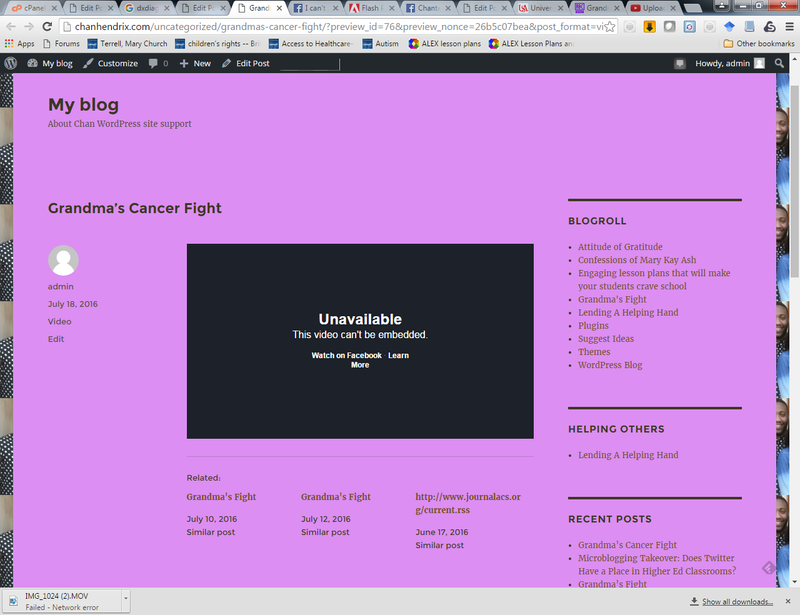 I have posted the video on my blog page under the blogroll…it it now linked to facebook and does not require a login. I gave it several test runs. The above link does not show the video on facebook. Did you test in a Chrome Incognito window? But that’s the Facebook link, not the one that you have the screenshot of. Your screenshot does not have your video embedded. Your post here does not have the video embedded. Still working to figure out the issue here. I will continue to work on it Sunday following my grandmother’s funeral services. Thank you. Link to video would not open in incognito, so I am still unsuccessful with embedding the video. 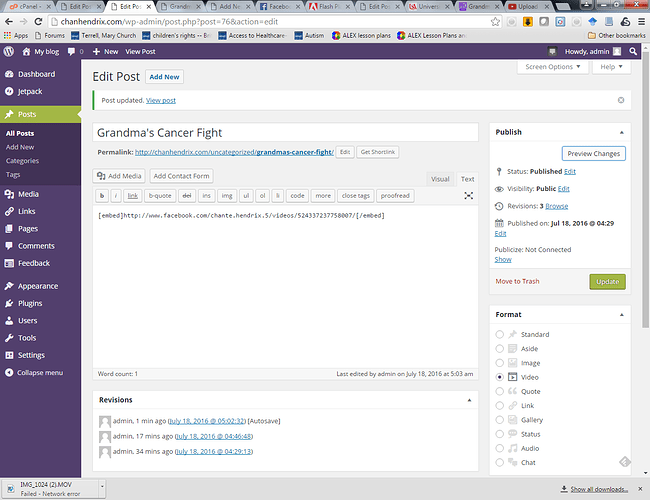 Creating my digital storytelling assignment took me more than the estimated 8 hours of completion time likely due to the distraction of the passing of my grandmother. Creating this video was timely as I initially tried posting by creating a YouTube account which I could not master by the assigned due date. Therefore, I decided to upload to my Facebook account. Dr. Pfaffman noted that my link did not show on Facebook, so I tested again in Chrome Incognito and have not been successful. Above is a screenshot noting my challenge. 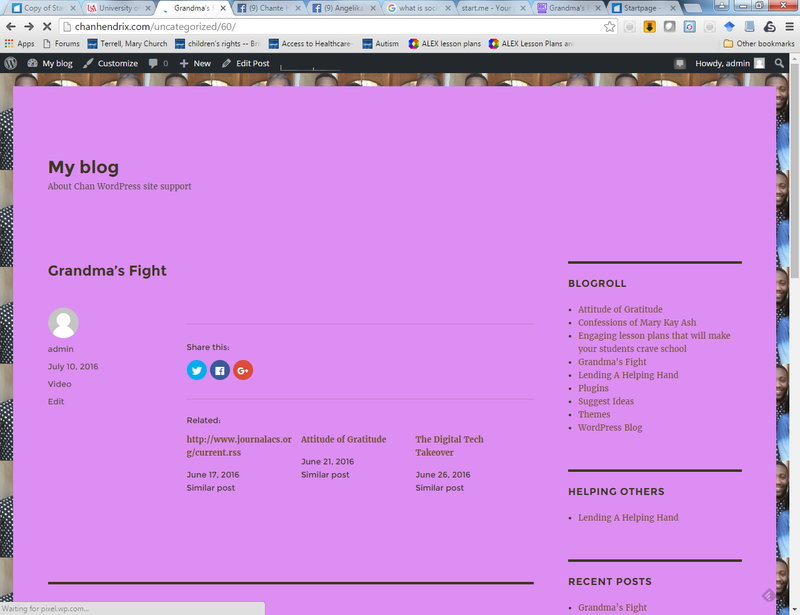 By no means am I a digital intellect, but trying to navigate through this project to a successful completion. It appears that I have inherited a virus on my computer which is the likely hood of not being able to upload my video. I am seeking further assistance. Still trying but will not embed the video…I suspect the noted virus on my computer is the challenge here?..we will check with our computer technician on tomorrow regarding the suspected computer virus. I will also try to embed on another computer on tomorrow. Thank you. I suspect the noted virus on my computer is the challenge here? I doubt it. 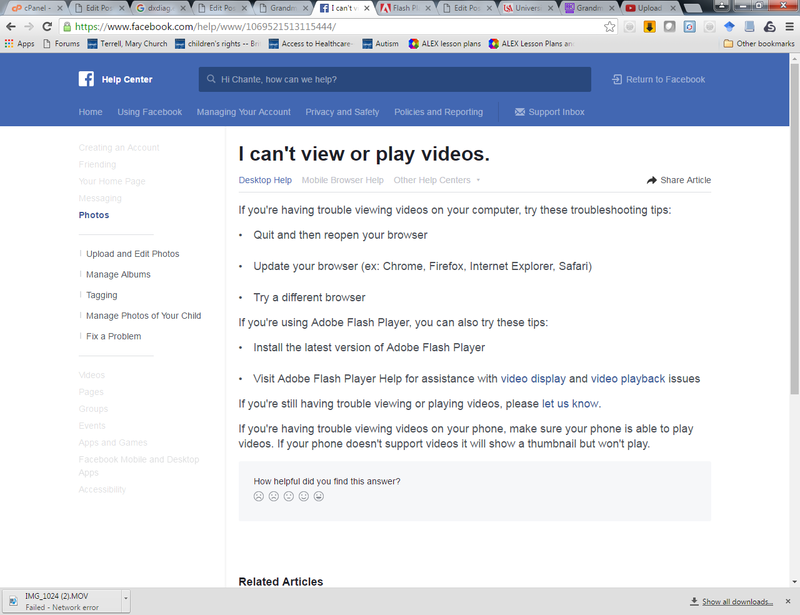 I suspect that the problem is that, as a rule, Facebook wants everyone to use Facebook for everything all the time, and doesn’t really want you to be able to embed vidoes there without giving them access to all of your private information. 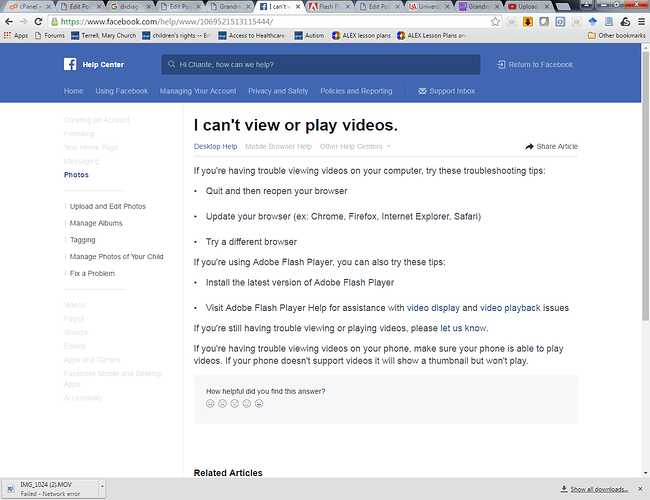 If you are planning to use videos in your classes, then, as you are seeing, Facebook is not a very good place for sharing videos. I’d recommend that you upload the video to your own blog (searching for “wordpress allow video upload” will find pages like “how-to-allow-users-to-upload-videos” with instructions for changing the settings to allow video uploads. Youtube is another place to upload videos.